Truc Lam Temple located near the side of Tuyen Lam Lake, built on 2 ha of land, and inaugurated in 1994, Truc Lam Monastery is deemed to be the largest one nationwide, both in space and the scale of training. 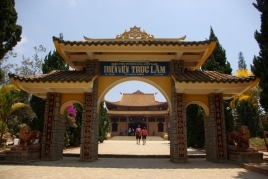 Truc Lam Buddhist Pagoda is located on Phuong Hoang Mountain, by Tuyen Lam Lake in Ward 3,Â Dalat City, Lam Dong Province.Â Truc Lam Buddhist Pagoda is located amidst beautiful natural scenery. This is the biggest pagoda inDalat City. 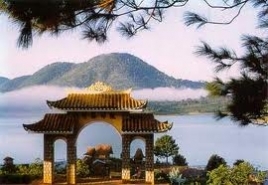 The temple is located outside the centre ofÂ Da Lat. 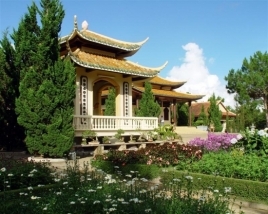 From the district of Hòa Bình in the city centre ofÂ Da Lat, the temple is located at a turnoff on the road from the city centre towards Prenn Hill, the temple is near the Tuyền Lăm Lake, located on Phượng Hoàng Hill.